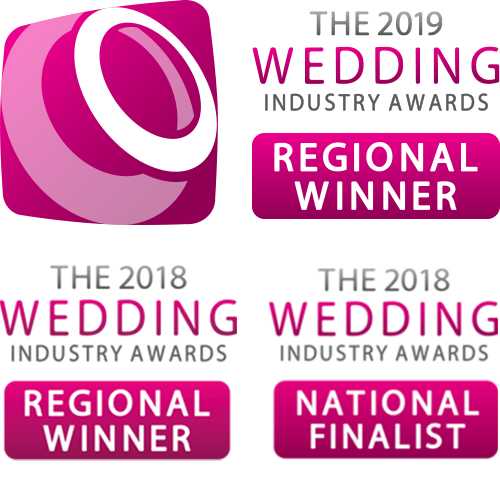 With all this wonderfully hot & sunny weather we have been having recently, our outdoor ceremonies have been incredibly popular and we are seeing the numbers of enquiries for these rise. Everybody hopes for sunshine on their wedding day, but it can be quite exhausting in the heat. Make sure you have some shade provided – pop up gazebos or parasols can be really helpful. 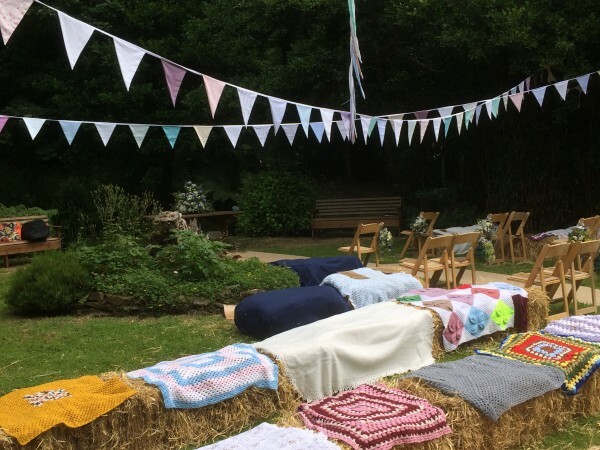 Hay bales look great – you can cover them with blankets or old curtains for a festival feel and look which makes them more comfortable. Think about arranging seating in a semi-circle rather than formal rows. Always have some water available to ensure everyone is hydrated in the heat! We always carry bottles of water with us. Have some sunscreen on hand to make sure no one gets burnt – including the bride! Think about access for your guests and let them know the conditions they can expect underfoot and how far they will need to walk to allow them to choose the best and most suitable footwear. This is always helpful, wherever your wedding is – the windy lanes in Cornwall are notorious for enabling even the most sat nav savvy guest to get lost! 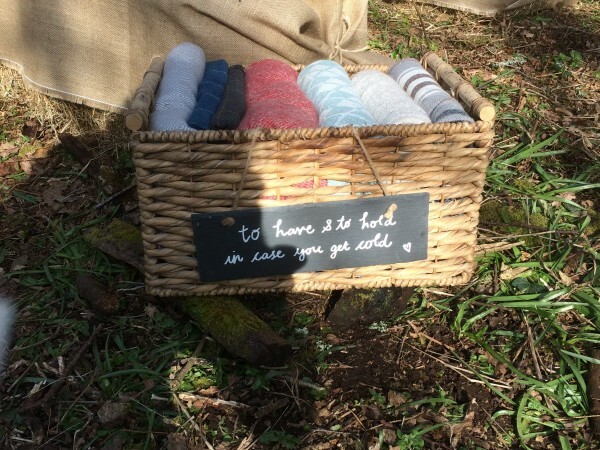 Give them clear instructions about their duties on the day – they are invaluable for an outdoor setting. The sky’s the limit – from floral arches, to twisted willow arrangements to decorate and to give a focal point for the ceremony. Think about how they will react in a breeze, or in direct sun. If you are having an outdoor ceremony, you need to think about whether or not you will have access to power for things like your music and any lighting etc. We’d suggest using battery operated speakers if there is no power source close by. Cornwall is well known for its lush, green countryside and for a good reason, as it is prone to changeable weather at times! It is always best to have a backup plan – we’d recommend lots of umbrellas! 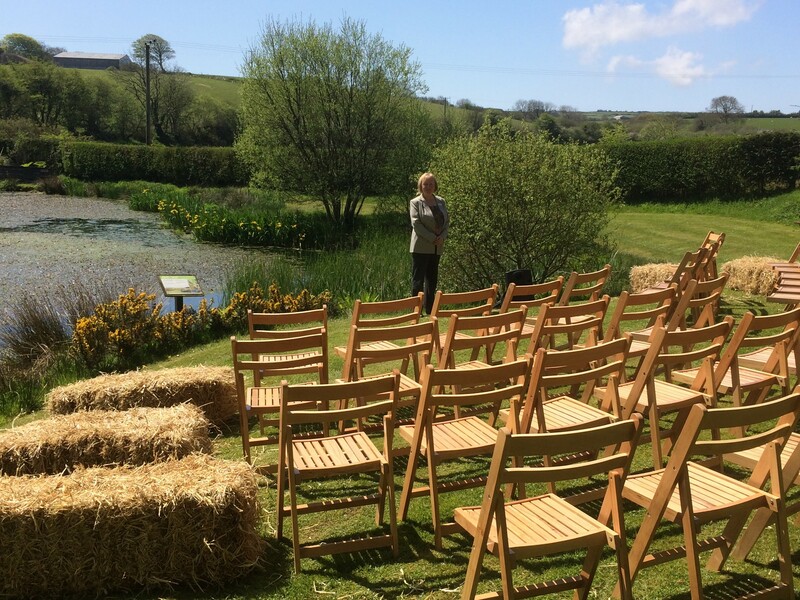 Good luck with the planning of your outdoor ceremony and if you would like to discuss your ideas with us, please do get in touch. We have put together a handy little blog post on ‘How to choose your celebrant’ find out more HERE.